If you provide care for a loved one who has Alzheimer’s disease then you are certainly not alone. According to the latest figures from the Alzheimer’s Association, 15.4 million family and friends provided 17.5 billion hours of unpaid care to those living with a diagnosis of Alzheimer’s disease or other types of dementia last year. Professionals recommend having a care plan to reduce emotional stress and ease the burden of providing day in and out care. 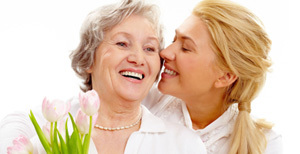 Care plans usually include schedules for appointments and medication reminders as well as more detailed notes on what to do to ensure your loved one remains engaged and connected to existing community resources and activities. Great advice - but what happens when your loved one no longer wants to participate in those familiar activities? Unfortunately changes caused by emerging Alzheimer’s symptoms will often result in loss of independence, reduced self confidence, decreased social engagement and depression. To make matters worse, social withdrawal and increasing isolation exacerbate both physical and cognitive decline for your loved one while increasing stress and care burden for family and caregivers. Often the extra work families and caregivers willingly do to care for a loved one leaves them very little time for anything else including researching new programs and activities. What to do? *In FDIP clinical trials more than 70% of program participants/care providers reported improvements in AD-Quality of Life (AD-QoL) scores at 12 months follow up. The AMM program is neuropsychology based to promote participant self confidence and esteem, greater social interaction with family and community, increased awareness of self, greater enjoyment of activities and positive mood response to surroundings. Developed by a select team of specialist therapists from multiple disciplines including traumatic brain injury rehabilitation it also may reduce the need for psychotropic medications (often prescribed for agitation in later stage dementia). Call us today or contact your healthcare provider to learn more about the AMM Dementia Intervention Program. Because living with dementia isn’t just about hope for the future; it’s about making life better today!